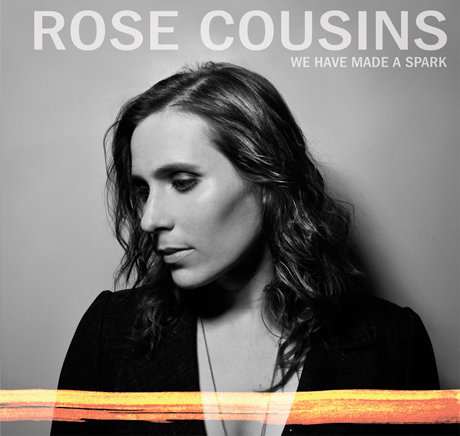 Over the past decade, Halifax-based songstress Rose Cousins has quietly built up a following with her folksy tunes, earning some praise from us in the process. Now, she's getting ready to drop her third full-length, We Have Made a Spark, on February 28 via Outside Music. The album was produced by Zachariah Hickman in Boston's Q Division studio. Some of the songs were written in a tiny cabin without electricity on an island in New Hampshire, and the results reportedly range from a "stark piano ballad" to more "driving" full-band songs. Get a taste of the latter in the form of opening track "The Darkness," which is available via the widget embedded at the bottom of this page. Of the themes covered in the lyrics, Cousins said in a statement, "We develop patterns that keep us from moving forward. It takes a deep breath and a bucket of courage to face the uncomfortable, painful things we work so hard to avoid. Reward comes from recognizing the obstacle exists and pushing through fear." The album was made with help from a Kickstarter campaign. It will include a short documentary called If I Should Fall Behind, which a press release notes is "about the heart of the community where the record was made." 9. "If I Should Fall Behind"
10. "All The Time It Takes to Wait (Boston Version)"
11. "White Daisies (Boston Version)"